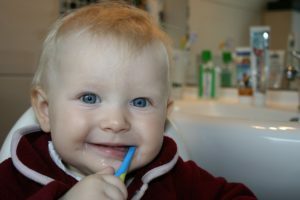 When Should I Bring My Child In For His Or Her First Dental Visit? The American Academy of Pediatric Dentistry along with the specialist at Orthodontics and Dentistry for Kids recommend making your child’s first dental visit before their first birthday. This is because healthy dental habits, from the start, will have a lasting impact on your child’s smile and overall health. Healthy baby teeth will result in healthy permanent teeth and a lasting, beautiful smile. Baby teeth have an effect on the way your child speaks and eats. By bringing your child to the dentist at an early age they can build a trusting, friendly relationship with the dentist that can last a lifetime. Also, if your child is missing any baby teeth, this initial dental visit can identify the need for orthodontics. As a parent, you can come and learn the importance of oral hygiene, the relationship of nutrition to dental health, cavity prevention, the importance of fluoride, and all the other components to keeping your child’s teeth healthy and strong. Our pediatric professionals at Orthodontics and Dentistry for Kids is prepared to make your child’s first visit an enjoyable experience. An initial visit will sometimes include digital x-rays, a review of the child’s health history, a full mouth exam, and an assessment of the child’s dental needs. The dentist may also check the gums and surrounding tissues to identify any potential problems. The child will then have a cleaning and fluoride treatment. He or she will also be taught how to properly brush and floss. For younger children, parents will be taught how to care for their child’s teeth. Why See A Pediatric Dentist At Orthodontics and Dentistry for Kids? It is important for your child to see one of our pediatric dentists because this ensures that your child’s first visit is with a professional that is trained to see kids and understands the dental needs of children. If the pediatric dentist does identify any areas of concern, where there may be a cavity or an over-retained loose tooth, our specialists will explain these concerns and ensure that your child gets the care they need and deserve. This is also a great opportunity to have all your questions answered regarding your child’s dental needs. If you are looking for the perfect kids dentist, who is also able to provide orthodontics, then we are the place to go. We are located in 2771-23 Monument Rd Jacksonville, FL 32225, United States where you can see a pediatric dentist and have all of the orthodontic needs of your child met. Finally, we offer sports mouth guards and pediatric night guards as well as many other preventive treatments. So make your child’s first visit a memorable one by coming to visit us. Looking for a pediatric dentist in Jacksonville, FL that knows how to care for baby teeth? Contact us to schedule your child’s first dental exam! We proudly serve children and their parents in Jacksonville, Jacksonville Beach, Ponte Vedra, Southside, and Mayport, Florida, and the surrounding communities.